What classes are you currently taking and when did you start? What do you like about Aerial? Has it affected/change your life? If so, how so? 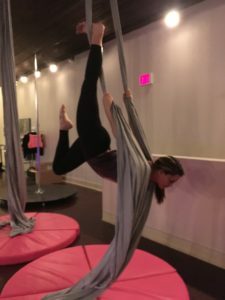 I love aerial silks classes because its a different form of fitness compared to your traditional sports. Its all your own body weight your working with. I also enjoy coming to the studio and seeing the girls every week that take classes too. They are great people. Any drop usually, but right now 360 drop. I will always be a fan of hip hop. But I would love to perform to something contemporary. Coolest place: Hawaii- Oahu/ Grand Canyon. Coolest thing I have done in my life: Hiked “Dead Mans Catwalk” in Hawaii. First Fridays in Lancaster, Tellus 360, Food Truck Park, Market, The Dispensing Company on Mondays for $1 Tacos. Just do it, fear is not an option.